(Nanowerk News) The future of prostate cancer therapy may lie in a tiny, "sticky" silicon chip dubbed GEDI (Geometrically Enhanced Differential Immunocapture, pronounced like the "Star Wars" forces of good) that can identify and collect cancer cells from a patient's bloodstream. A team of researchers at Weill Cornell Medical College in New York City and Cornell's College of Engineering in Ithaca has built the chip into a device that captures an unprecedentedly high concentration of rare cancer cells from metastatic prostate cancer patients for a quick, noninvasive analysis to determine the efficacy of the patients' current chemotherapy. The ability to collect a relatively pure sample of circulating tumor cells (CTCs) may also enable research to better understand the biology of metastasis and develop new treatments, the researchers said. The "sticky" square patch (middle) of the GEDI device contains the purest collection of circulating tumor cells in the blood. The rest of the blood cells are discarded in the capsule. Their work is described in a paper in the April 2012 issue of the journal PLoS ONE ("Functional Characterization of Circulating Tumor Cells with a Prostate-Cancer-Specific Microfluidic Device"), and was announced in a press conference at Weill by Brian Kirby, associate professor of mechanical and aerospace engineering; David Nanus, M.D., the Mark W. Pasmantier Professor of Hematology and Oncology in Medicine; and Evi Giannakakou, associate professor of pharmacology. The team includes 12 other researchers from both campuses. Metastatic cancer is cancer that has spread from the place where it first started -- in this case, the prostate -- to another place in the body, most commonly the lungs, bones and liver. Metastasis accounts for the majority of cancer-related deaths. "We need to be able to match the drug to the patient and the tumor," said Nanus. But tumor cells habitually mutate and develop a resistance to a previously effective therapy. In the case of prostate cancer, three drugs are in common use, but the most effective one varies with the patient and the particular cancer. Metastasis is believed to be caused by cells that detach from the primary prostate tumor, circulate in the bloodstream and seed new tumors. Extensive clinical research shows that a reliable CTC count is a strong predictor of overall survival in metastatic prostate cancer patients. However, since the incidence of CTCs can be very small -- one CTC per 100 million blood cells -- pure CTC capture is difficult. "This really is a needle in a haystack," Kirby emphasized. Cell-capture devices now in use contain antibodies that bind to an antigen found on the surface of nearly all malignant prostate cancer cells. But these antibodies also bind to other cells in the bloodstream and can collect a highly impure sample. On the GEDI chip, a milliliter (mL, one-thousandth of a liter) of blood is pumped through a nanoscale channel filled with tiny posts just a few microns (millionths of a meter) in diameter, coated with antibodies. Successive rows of posts are offset in a carefully calculated way so that only cells larger than 15 microns will collide with the posts and stick to them, while most smaller cells flow smoothly around them. "Most cancer cells are bigger and more rigid than normal cells, so it's about tricking these cancer cells into colliding with the sticky walls," Kirby explained. 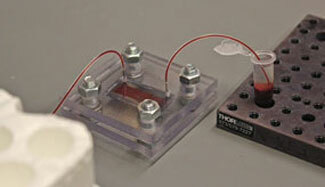 After the test the chip is removed from the device and the captured cells extracted for analysis. In an experiment with a blood sample containing 200 mL of CTCs and 5 billion blood cells, the device captured a whopping 170mL of CTCs and only 91mL of irrelevant blood cells. The GEDI device is scheduled to go into clinical trial this year. Meanwhile, the researchers are actively working on detectors for breast, ovarian and pancreatic cancers. The research is one of several joint Ithaca-New York City projects associated with the Cornell Center for Microenvironment and Metastasis, a $13 million National Institutes of Health-funded Physical Sciences-Oncology Center created to use physical techniques and processes to improve understanding and care of metastatic cancer in patients.